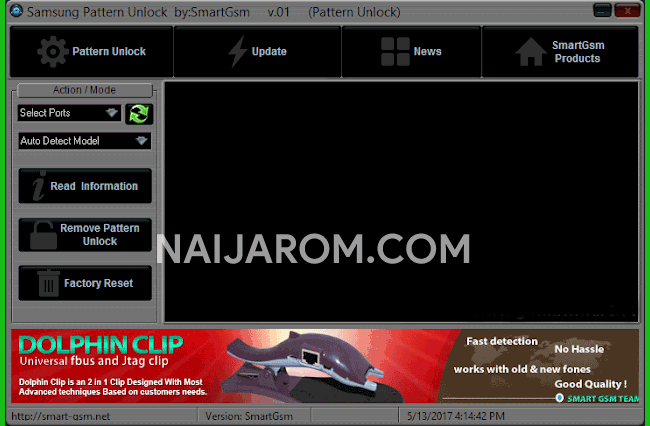 Samsung Pattern Unlock Tool is a small application for windows computer which allows you to read the Samsung Device information, remove the pattern lock from Samsung device, factory reset the samsung device. To use the application, you need to install the ADB Driver on your computer, then after boot your Samsung Device into the ADB or Download Mode. Once your device is booted into the ADB or Download Mode, connect your device to the computer and click on the Read Information button and then after click on the Read Pattern Unlock Button to unlock your device. [*] Credits: Samsung Pattern Unlock Tool is created and distributed by Smart GSM Team (developer). So, full credits goes to Smart GSM Team (developer) for sharing the tool for free.